The Chippewa Trail is a paved trail that winds 3.5 miles from downtown Midland to the outstanding Chippewa Nature Center. The scenery is interesting in places but not overly impressive. 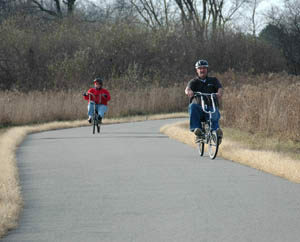 The trail, however, makes for an excellent family adventure whether on bicycles, in-line skates or on foot. It begins at the unusual Tridge, a bridge that spans the confluence of the Tittabawassee and Chippewa rivers, and ends at the nature center where you can view the confluence of the Pine and Chippewa rivers. Extensively renovated in 2009, Chippewa Nature Center is an ideal place for an extended break before heading back. Inside is the popular Wildlife Viewing Area, the River Overlook with its view of two rivers, Ecosystem Gallery and a hands-on, kid-friendly play area along with restrooms and drinking water. In between the bridge and the interpretive center is a flat asphalt path that is lined by almost a dozen interpretive panels describing historical, cultural and natural features of the land it passes through. The award-winning panels were designed by the staff at the Chippewa Nature Center and turns the trail into an educational experience as well as an outdoor adventure. 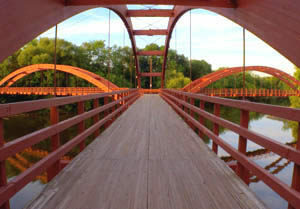 Start in downtown Midland at the Tridge which city officials claim is the only three-way footbridge in the world. Built in 1981, the wooden spans of the Tridge connect three shorelines. In the middle they form a hub where benches overlook the merging currents of two rivers and from each one a paved path spirals out like spokes on a wheel. On the east bank of the Tittabawassee is the Pere Marquette Trail that heads northwest towards Clare. 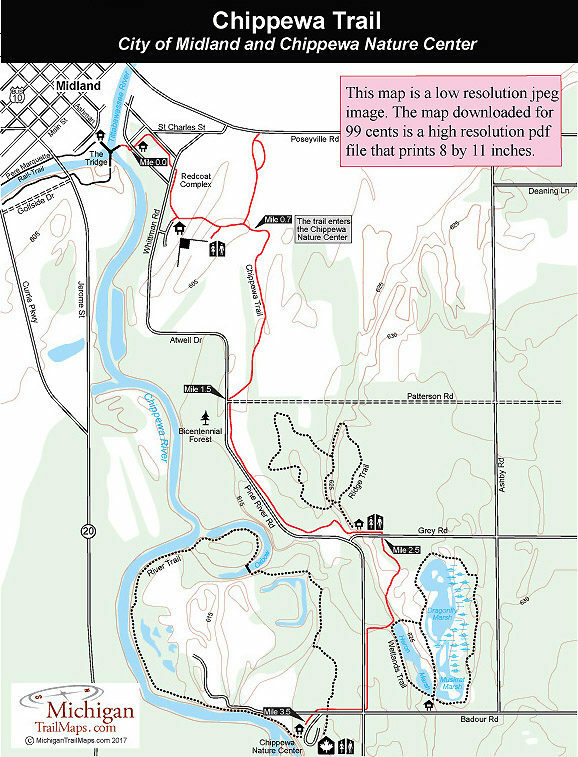 The left span leads to the south bank of the Chippewa River where at the corner of Townsley and Chrissey streets is the trailhead of the Chippewa Trail with a parking area and a large display map. The trail begins in the City of Midland’s Redcoat Complex winds pass softball fields and a disc golf course and crosses two roads. Spurs lead to restrooms and a picnic area. At Mile 0.7 a sign announces you’re entering Chippewa Nature Center and that dogs are not allowed further on the trail. Transitioning from softball fields to an open meadow, you’ll see more birds and other wildlife than pop-ups and foul balls. At Mile 1.5 the trail crosses Patterson Road and then hugs Pine River Road past Bicentennial Forest. Eventually the trail enters a young forest and swings away from Pine River Road, arriving at the trailhead parking area for the Chippewa Nature Center’s Ridge Trail. There is a large display map and vault toilet here along with the opportunity for hikers to add additional mileage. The Ridge Trail — closed to bicycles and mountain bikes — is a 1.5-mile loop with a crossover spur that includes climbing a shoreline ridge of an ancient lake. From the parking lot, the Chippewa Trail briefly parallels Grey Road before crossing it at Mile 2.5. On the other side is a scenic patch of woods that gives way to the nature center’s Wetlands Area, making this the most interesting area of the trail. The Chippewa Trail skirts the cattailed-infused east end of Heron Marsh where there is a bench, an interpretive display and access to the Wetlands Trail, a 1.7 mile loop. Beyond the wetlands, the Chippewa Trail briefly parallels Pine River Road and then crosses the busy road at Mile 3.25. You pass through one more tract of woods, passing signs for the River Trail before arriving in the nature center’s parking lot at Mile 3.5. Trailhead parking is available at a number of places along the Chippewa Trail including the Tridge, Redcoat Complex park and Chippewa Nature Center. Chippewa Trail is open from dawn till dark daily. The Chippewa Nature Center is open 8 a.m. to 5 p.m. Monday through Friday, 9 a.m. to 5 p.m. Saturday and 1-5 p.m.Sunday and most holidays. There are no user fees to Chippewa Trail or Chippewa Nature Center. Head west on US-10 and follow Business US-10 (also labeled M-20) into Midland. Downtown, Business US-10 becomes Indian Street. Turn left on Ashman Street where the Tridge is posted. Follow Ashman five blocks to the Midland Farmers Market where there is parking at the foot of the Tridge. Contact the Chippewa Nature Center (989-631-0830; www.chippewanaturecenter.org) or the Midland County Convention & Visitors Bureau (888.464.3526; www.midlandcvb.org).